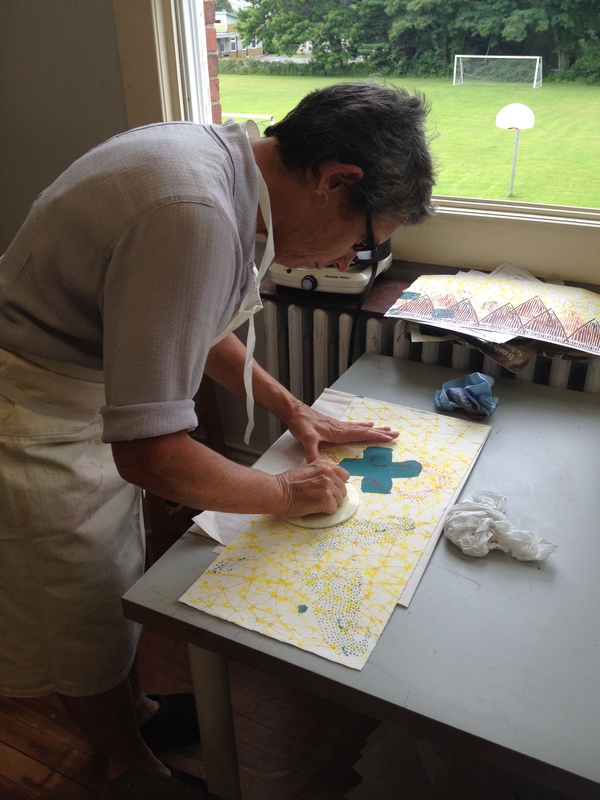 In August we had the opportunity to work with a great group of artists at Waterfall Arts in Belfast, Maine. We led a printmaking workshop we call Image Traffic as part of the group exhibition Living in These Bodies. The workshop focused on printmakings capacity to steal, borrow, recycle, and reinterpret images from popular culture, media outlets, and art history. Participants worked with found and appropriated imagery, including the Future Mothers lexicon, and used a range of techniques including rubber stamps, xerox lithography and screen printing. Each participating artist created a edition of three unique prints and contributed to a forthcoming Future Mothers zine. We look forward to incorporating their work into our 2015 project, FUTURE MAG. Elizabeth A. Jabar is a print based artist whose hybrid works on paper explore ideas of ethnicity and heritage. Her printed assemblages and artists’ books display a highly personal visual language that incorporates cultural motifs from folk art, religious traditions and textiles. Her practice also encompasses collaborative endeavors and social practice projects with her students and colleagues, including her recent project Future Mothers, which launched at the Institute for Contemporary Art in Portland, Maine in 2012. Elizabeth Jabar Jabar’s work is in the collections of Pratt Institute, Nova Scotia College of Art and Design, Tides Insti­tute, Maine Arts Commission, Amity Arts Foundation, New York Public Library and Print Zero Studios. 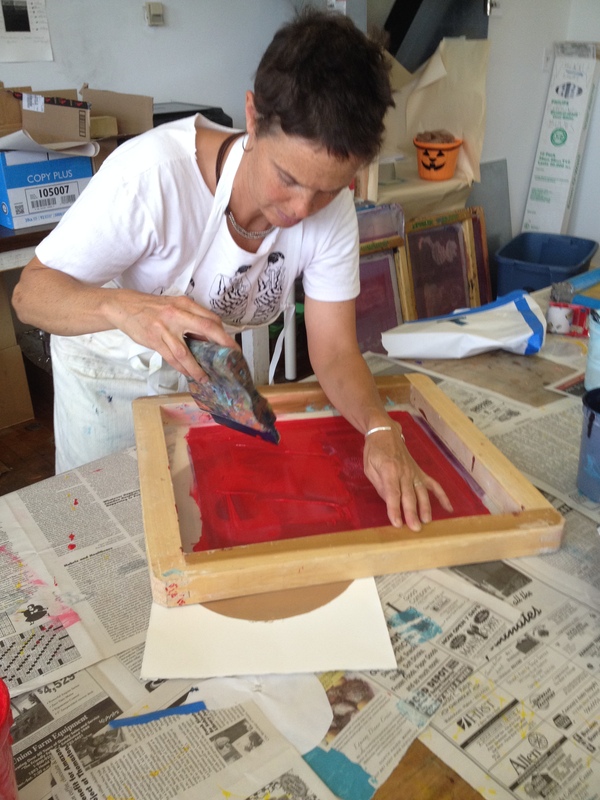 Her work was recently published in Maine Art New and 50/ 50 A Survey of Contemporary Printmaking. Jabar has also won grants and awards including a fellowship residency at Vermont Studio Center and a Good Idea Grant from the Maine Arts Commission. Elizabeth is the Assistant Dean and Director of Public Engagement at Maine College of Art in Portland, Maine, where she also serves as Associate Professor and Chair of the Printmaking Program. She received her BFA from Massachusetts College of Art, Boston, Massachusetts and her MFA degree from Pratt Institute in Brooklyn, NY. Her works have been shown at galleries and museums nationally and internationally, including Vic­toria Arts Connection, Victoria, BC, Canada, Red Gher Gallery, National Gallery of Art, Ulaanbaatar, Mongolia, Women Networking, Zanzibar, Tanzania, Pyramid Atlantic, Rhode Island School of Design, Long Beach Island Foundation for the Arts and Sciences, Montserrat College, Colby College Museum of Art, The Institute of Contemporary Art at Maine College of Art, The Center for Maine Contemporary Art, University of New England, The College of the Atlantic, La Jolla Fiber Arts, La Jolla California, Print Zero Studios, Seattle, Washington, Brighthill Press, Treadwell, New York, Hunter College, New York and The Center for Book Arts, New York, NY.